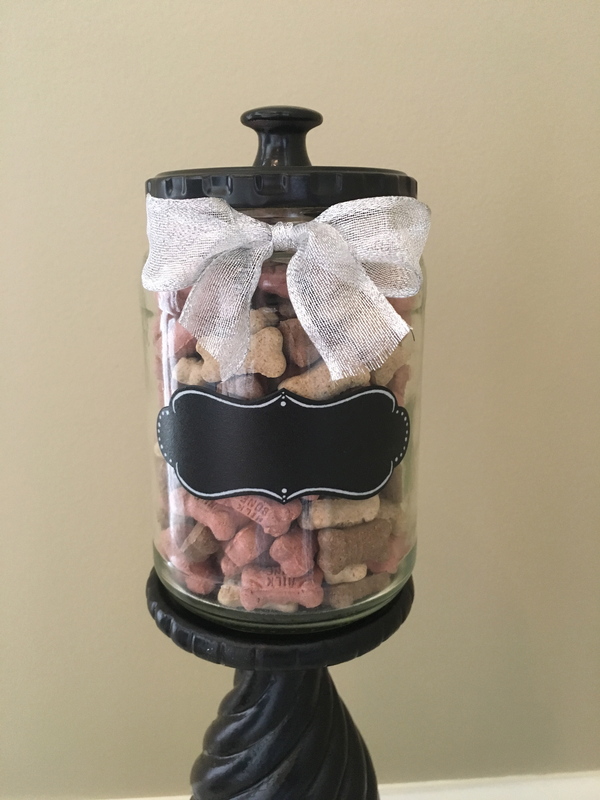 Recently I shared a quick and inexpensive way to use pickle jars and turn them into treat jars for your pets. Really any kind of glass jar would do. I’ve been experimenting with different sizes and styles and then I found this! I was running errands yesterday and stumbled upon a new thrift store on the edge of town. It supports women and girls around the world who have been victims of human trafficking. Many items are donated, but many are handmade items from survivors of this crime. So, I was glad to purchase a few things and make a donation. One thing I found was a short candle holder for a few dollars and thought it would be a perfect stand for one of the treat jars. So, a quick coat of Rustoleum black satin spray paint on the candle holder, lid of the pickle jar and a wooden knob and it was quick and easy! After the spray paint dried, I glued the knob on top of the lid and the jar on top of the candle holder using E6000 glue. I tied a silver metallic ribbon around the neck of the jar. The chalkboard sticker is from a pack that I bought at JoAnn Fabric for a few dollars for a pack of 8. You can write on them and reposition them which is nice. I added some of Lacey’s 5 calorie treats and she has a pretty new treat jar for just a few dollars. So simple that kids could easily make these! Have a wonderful weekend! I like to try too make a Treat Jar but how you get the smile out the Pickle Jar. Sorry for the delay getting back to you. I assume you mean “smell” out of the pickle jar? Try soaking it in soapy water for 15 minutes prior to moving to the next step. Please let me know if it works out for you.